A virus is another possible cause of MS. This is the most likely suspect in the ongoing search for what causes multiple sclerosis. But even so, researchers have not pinpointed a specific one that is definitively the cause. Research is going on all around the world. So it's not for lack of trying that scientists and doctors haven't found one yet. Several have been found to be closely linked to MS. Here are a few of them. Researchers have found that the Varicella zoster is at high levels in the cerebrospinal fluid of people with MS. The ones that cause Human herpes are also linked to multiple sclerosis. And the one called Epstein-Barr was thought to be one of the leading causes, because of the absence of MS in people who were never infected with it. This fact is a big red flag in my book. 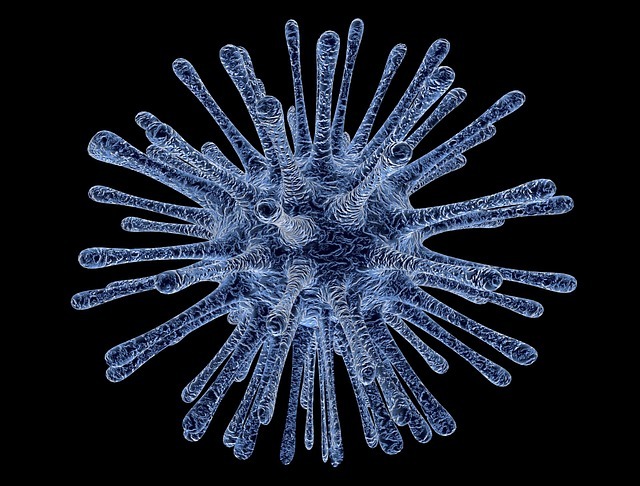 Viral infections are thought to be a reason for eventually developing MS in susceptible people. Cir has had numerous sinus infections as a child and young adult. And occasionally, he still gets them, though not as much when he makes sure to get enough vitamin C.
Many of his friends, who are MSers, have also related that they had many infections as children, as well. The relationship between multiple sclerosis and viral infections is very strong. If you are susceptible to getting infections, take steps to keep from getting them. Eat healthy, exercise (moderate or light, depending on your particular limits). Take care when you are out and wash your hands, especially when you get back home. I make it a point to do this as soon as I walk in from outside, just to make sure I don't spread anything to Cir that I've picked up on my travels. I think, if MS is caused by a virus, or at least if it's one of things that must be present - one of many variables - then eliminating that variable will be half the battle. So get to work, scientists and researchers! A cure is surely in your view! Click the link to read more about the causes of MS.